Each week a small flower arrangement is placed on the side altar (except during Lent). Many people wish to create the arrangement themselves in memory of someone or to celebrate a special occasion, and they indicate this on the rota at the back of church. If you don't feel confident to create an arrangement yourself, you can "sponsor a Flower Lady" to do it for you (by adding an asterisk when you put your name on the rota). The church is beautifully decorated for Christmas, Easter and Harvest. Here are photos of some of the Easter 2018 arrangements. 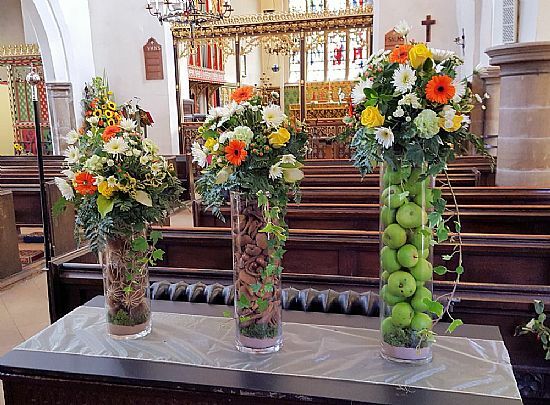 In addition to decorating the church for regular services and festivals, the church's skilled flower arrangers provide their expertise for weddings and funerals in the church. Find out more from: Pauline Voce. 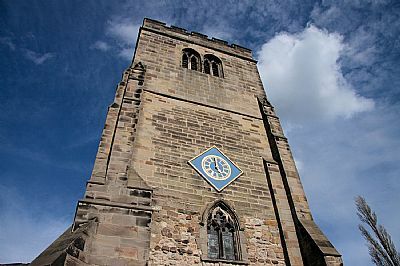 The art of change ringing evolved in England in the early 17th century and is practised at St Mary’s on the peal of eight bells, the oldest date from 1894; the newest were installed in 2009. We have an active band of ringers who ring for Sunday services, weddings and other special occasions. 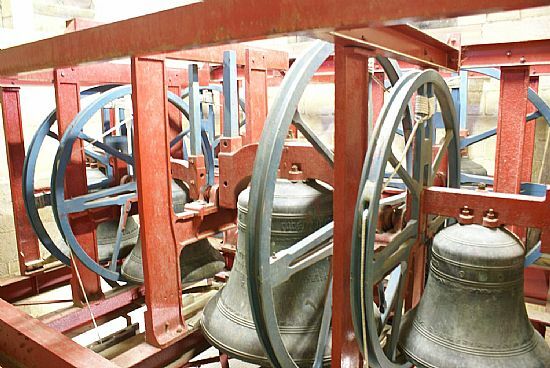 Did you know: bells are the largest and loudest instrument in the world; and ringing is a good way of getting gentle physical exercise, see Bell Ringing for Fitness. In order to ensure that we continue to have enough ringers for services and regular practice, we welcome new ringers, including ‘lapsed’ ringers who haven’t rung for a while. Bell ringing is open to everyone with any level of fitness. Young ringers are welcome too, the only criteria being that they are capable of reaching the bell rope and handling the bell – typically 10 to 12 years old and upwards. And, of course, all tuition is free. If you’re interested in seeing the bells rung, and even having a go yourself, why not come along to our practice night and see for yourself what is involved in this ancient, quintessentially English pastime. Practice nights are every Monday evening from 7:30pm until 9:00pm and we’re always pleased to greet new, visiting and returning ringers. To find out more (or indeed everything) about church bell ringing go to Discover Bell Ringing. To find out more about ringing at St Mary’s, get in touch with Susan Manley, the Tower Contact. 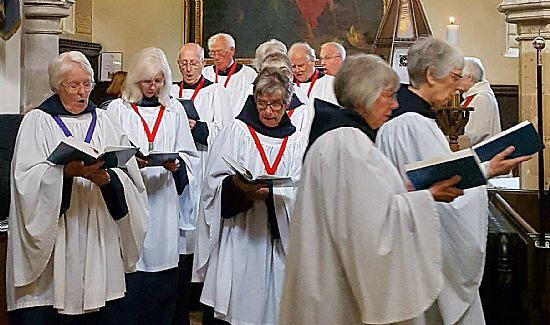 St Mary's has an enthusiastic robed choir who lead the congregation in worship, accompanied by the organ, which is often played by renowned local organist Neil Page. In addition to Sunday services, the choir sing at weddings for which they receive a small fee. They also perform anthems for special services, and are particularly busy over Easter and Christmas, with both Advent and Christmas carol services. Choir practice is in St Mary's Church on Wednesdays at 7:00pm. Newcomers, ideally with a basic ability to read music, are always welcome. Find out more from: Angela North. We set up St Mary's Mission Group to spread the Good News within our parish and to support the Diocesan agenda "Wider Younger Deeper". The Mission Group reports to the Rector and PCC but membership is open to everyone in the parish so that they can express their ideas and contribute to parish development. So far, the group has started holding Lenten Lunches in the Burnside Hall, re-introduced carol singing around Plumtree village and held annual "Light Parties" as an alternative to Hallowe'en. The Mission Group meets in church on the first Monday of the month from 5:30pm until 7:00pm. If you'd like to be involved or keep up to date with what the group is doing, find out more from: Jackie Clark or Tony Darby. This is a group of volunteers who provide pastoral support for members of St Mary's worshipping community who are unable to come to church through illness or infirmity, and in times of distress. Pastoral support can include a visit by a volunteer or a friendly voice at end of a phone line. Also, if you used to receive Communion at St Mary's, but can no longer attend in person, the Pastoral Group can arrange for Home Communion to be brought to you in your own home. Do you feel isolated? Do you have a new baby, or a little one at the school or nursery? Perhaps you have just moved into the area. Do you wish there was a local place where you could meet up with other people for a chat? Starting on Thursday 14th February 2019, Plumtree Welcome Café is a new venture to be held in St Mary's church every Thursday afternoon between 2:00pm and 4:00pm. Staffed by volunteers, the café provides a venue where you can meet people at weekly informal gatherings. It's not a club, there's no membership and it's open to everyone, no matter what your circumstances. What's more, it's free and there will be tea coffee and biscuits. Come along to see what it's all about. You're welcome to stay for the full two hours, or just drop in for 10 minutes. Plumtree Welcome Café is part of the national Places of Welcome network - a growing network of local community groups providing their neighbourhoods with places where everyone can join in, connect and contribute. There is more on the Places of Welcome website. To find out more about Plumtree Welcome Café, or if you are interested in becoming a volunteer, please contact Fiona Carruthers. Or just come along to the café, you'll be made very welcome.